I caught the autograph collecting bug back in 1993 when I met the legendary Adam West at a US Comic Con. After that I began to obtain autographs to retail in my UK based comic book stores. These days we retail online and at many of the UK and European Comic Cons. All of our autographs are currently obtained by us from these Comic Cons and our own Private Signings. Nothing is obtained through the post. All of our autographs are issued with a tamper-evident unique identifier sticker on the reverse of the photo. The information on that sticker matches the information on our COAs. We can use that information to tell customers when and where any of our autographs were obtained giving a paper trail all the way back to the day the signature was obtained. You will find a good selection of our stock in our eBay store, but you will find our best and fullest stock on the main celebrityinkautographs.co.uk website. 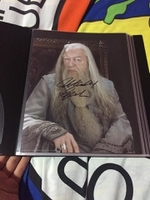 Please check out our In-Person autograph company - Hollywood-Autographs.com for the finest in-person autographs obtained from around the world. Happy Collecting! 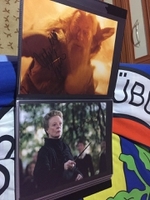 Dave Dave Dave what a great man He was so nice and helping me a lot for my Harry Potter collection.